I'm pretty sure it's a weed by how fast it's growing, but she's loth to throw it out until she know's what it is. edited to add I've tried identifying it on the web but most sites first question is what's the name of the thing! Try drying some leaves and then smoking them. PS, it looks like a tomato plant to me (but I'm an engineer, what would I know?). There are various species all with different leaf shapes. Last edited by G-CPTN; 12th Aug 2006 at 17:07. No idea but when you find out let me know cos I've got one growing in one of my containers. 'Tis a well-known fact that tomato seeds have the ability (indeed that is how they propagate) to pass through the digestive system and remain fertile. Seeds could also be dispersed subsequent to the taste trials by surviving passage through the digestive systems of the people involved in the taste trials and through the sewage treatment system. Tomato seeds occasionally survive in treated sludge and can germinate. GMAC’s assessment was that the modified tomato plants would not pose a risk to the environment or the community even if they were to germinate in sewage sludge following the taste trials. Last edited by G-CPTN; 12th Aug 2006 at 17:22. Mrs Spork says, if it's got white hairs on it and it smells funny/horrible, then it could be Henbane which is highly poisonous. Apparently Dr Crippen used it. It looks a bit like ones pet weed one is growing just to annoy one's sis in law, (she has a great and irrational hatred of all weedkind) the afore mentioned weed is exceedingly fast growing and produced much in the way of foliage but as yet no flowers and is about three foot high now. Windy it is definitely not tomato and not cannibis. A weed is just a plant in the wrong place. 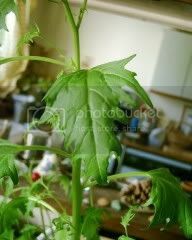 It is not what mrs windy intended to grow in the pot, ergo it is a weed. Maybe you should transplant it into it's own pot and let it grow, you could experiment on it with different kinds of music and see if you can influence the way it grows! Might I suggest no heavy metal tho, I tried that with some winter greens and gave the entire household a mild case of lead poisoning. What do you mean you don't have to shoot vegetables? I like to shoot my own food and those cabbages can be tricky little beggars! Especially when they lurk in the undergrowth and thrash their leaves around to frighten passers by. Relax, it's not a fart bush. Theres a plant that has appeared around here in the last decade or so it is quite large grows fast and gets covered in purple sort of spears,very pleasing to the eye,peeps on has asked about it say it is a weed,very fecund it is, chap in the next house along has a splendid example growing through the concrete of his carden path,Sis in Law looks at it and frowns tuts as she disaproves of weeds,personelly one thinks it is a splendid plant and wish it well, one can even forsee the day when it is upgraded from weedom and appears on telly garden programs. Jeez. You are all stupid. We now have a positive ID on the Triffid turns out it's a Plum Tomato plant. Mumsie is now a bit miffed she only kept the one and chucked out the other two. Especially now that Seymore is covered in Fruit. Apparently he was five foot tall before producing flowers. He's currently six foot tall and filling the green house.